According to Google, as at 2015, the most searched internet product in Nigeria is “Wedding”, that’s how obsessed Nigerians are about weddings. So it’s no surprise that in this current era of all things African being exported to the world, Vogue.com has just featured its first Nigerian wedding ever. 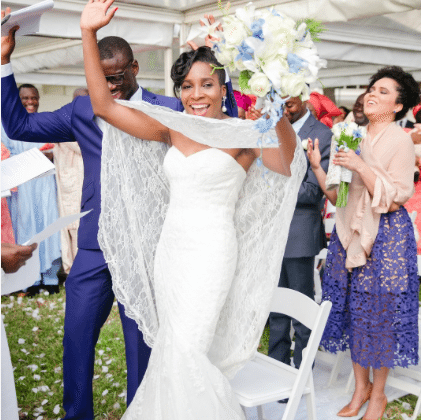 —Five thousand guests, she explains, some with corporate sponsors, circus performers, goodie bags that include iPads—that is the making of an extravagant wedding in Naija terms. Not something as “small” as her own two ceremonies (a white wedding followed the next day), up to six outfit changes, and two event planners. — she invited only 150 of her closest friends and family. It took some convincing of her groom’s family to hold the church service at the unconventional spot, so the couple provided “heel stoppers” for all their well-shod guests to ensure their stilettos wouldn’t sink into the grass. — the bride found her dress for the white wedding in just one day while visiting London’s Pronovias: a white lace sweetheart-neck bodice dress that was a far cry from the green gown she initially had in mind. “It was the exact dress I had told them not to let me wear! But I wore it and I didn’t want to take it off!” she explains. Despite all these personal touches, after one glance at her massive wedding photo album, one realizes that there was no keeping the occasion from becoming a lavish blowout. To read the full feature, visit vogue.com. Singer Zayn Malik Covers Paper Magazine Summer 2016 Issue | See Super Hot Photos!